PULLMAN – The seeds of Irwin Rose’s Nobel Prize were planted in a Spokane library more than 60 years ago. So the 79-year-old Rose was dismayed to learn last week about cuts in the city’s library system. Rose – the only Nobel laureate Spokane or Pullman can claim – was in Pullman on Friday to receive Washington State University’s highest alumni honor. He was so upset by the news about the library that he buttonholed Gov. Christine Gregoire in the halls. Spokane’s library hours have been scaled back all over town, with branch libraries open two or three days a week. Further budget cuts are on the horizon, unless voters approve tax increases. But Rose – who graduated from Lewis and Clark High School in 1943 and attended Washington State College – didn’t return to the Inland Northwest this week to assess the quality of the Spokane library system. 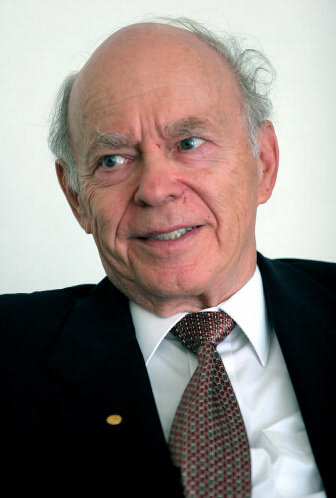 The winner of the 2004 Nobel Prize in Chemistry, Rose was given WSU’s Regents Distinguished Alumnus Award. In his introduction at an awards ceremony Friday, WSU President V. Lane Rawlins mentioned Rose’s experiences at the Spokane library. “I don’t know what kind of 15-year-old goes to the library and looks through the Journal of Biological Chemistry,” Rawlins said. Rose and two colleagues were awarded the 2004 Nobel for their research into the way proteins break down – a process called “ubiquitin-mediated protein degradation.” The process mediates as many as 1,000 different rates of deterioration for different proteins in cells, and is closely involved in the process of cell division. His work has helped lead to research on drugs that could fight Alzheimer’s disease, cancer, cystic fibrosis and Parkinson’s disease, according to WSU. “It’ll be some time before we really see the full impacts of the system on health problems,” Rose said. The research was done at Fox Chase Cancer Center in Philadelphia. Before that, Rose taught biochemistry at Yale University Medical School. He’s now an emeritus researcher at the University of California, Irvine, School of Medicine. Rose and two Israeli colleagues, Avram Hershko and Aaron Ciechanover, did the research in the 1970s and ‘80s. He said he had not expected to win the Nobel, which he was awarded a year ago in Sweden. Rose was born in Brooklyn and moved at 13 to Spokane, where, he says, he was “a fish out of water.” He graduated from Lewis and Clark High in 1943 and attended WSC for two years that were split by a stint in the Navy during World War II. He eventually graduated from the University of Chicago, where he did his doctoral work as well. During a session with reporters before the award ceremony, Rose talked about how he went to the library in Spokane and read the journals, and how he became motivated by trying to understand chemistry. At one point, he asked about the libraries and was told about the cutbacks in service. He said winning the WSU award was a highlight for him, because it was the only thing he’d ever won by himself.